I made the journey out to the the Salmon River (Pulaski, NY) this weekend with my good friend Michael. 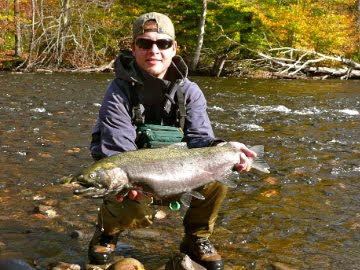 There is something about salmon season...now I'm not arrogant enough to say that I can get one of those moldy beast to grab a fly. In fact, I know that they won't (despite the claims of many on the river). 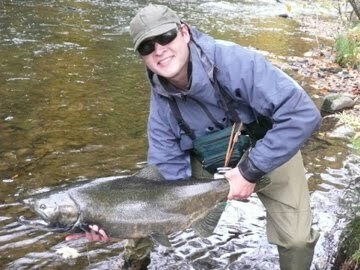 However the salmon season does serve one purpose- an opportunity at a 30lb+ fish on the fly. That, I find hard to turn down. It was a beautiful weekend on the Salmon. The foliage was amazing, the fishing was solid, and I can think of no better way to send off the salmon season than breaking my nine weight in half on 25lb+ king. A tribute to salmon season- farewell. Bring on the steele. Beautiful fish, great report, If I wasn't pumped before this update than the photo of your snapped 9 weight certainly did the trick. 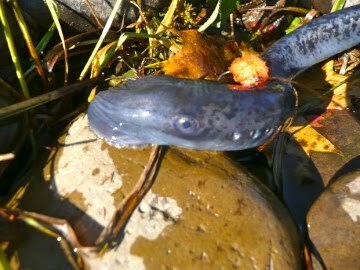 I arrived from the west coast yesterday to the intoxicating aroma of fresh lamprey on the grill. MMMmmm mmmm. Ain't nothin better. Hot damn, glad to see the pictorial tribute after hearing the report from the man himself. Well done Double-O!